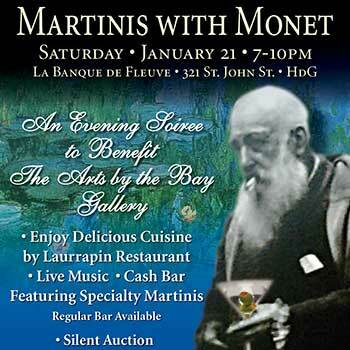 Arts by the Bay Gallery proudly presents "Martinis with Monet" a gala evening held at La Banque de Fleuve in Havre de Grace. Wonderful food provided by Laurrapin Restaurant. Silent Auction; Live Music.